Fulin Xing, Shuang Xun, Yanhan Zhu, Fen Hu, Irena Drevenšek-Olenik, Xinzheng Zhang, Leiting Pan*, Jingjun Xu. Microfluidic assemblies designed for assessment of drug effects on deformability of human erythrocytes. Fulin Xing, Fen Hu, Jianyu Yang, Leiting Pan*, Jingjun Xu. Structural and functional studies of erythrocyte membrane-skeleton by single-cell and single-molecule techniques. Leiting Pan, Rui Yan, Wan Li, Ke Xu*. 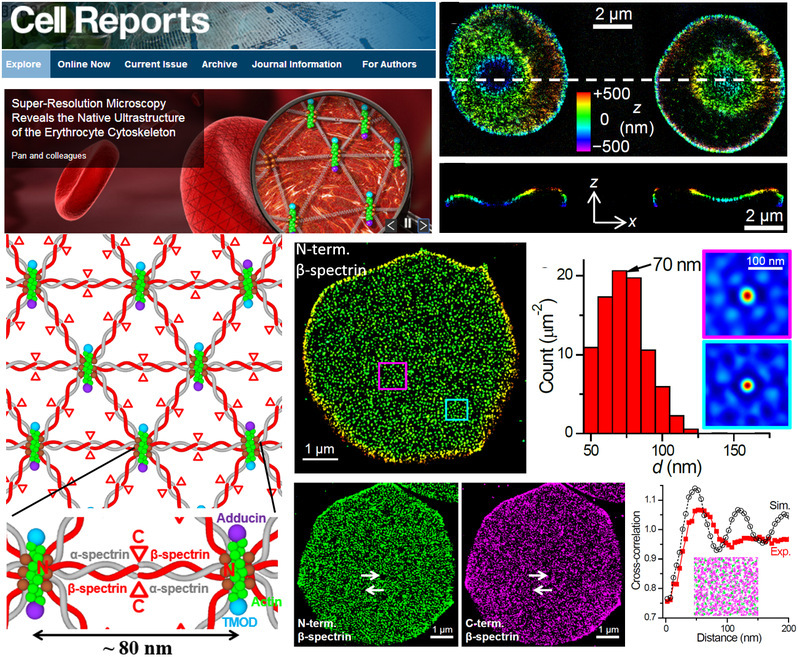 Super-Resolution Microscopy Reveals the Native Ultrastructure of the Erythrocyte Cytoskeleton. Fulin Xing, Ping Zhang, Pengchong Jiang, Ziyuan Chen, Jianyu Yang, Fen Hu, Irena Drevenšek-Olenik, Xinzheng Zhang, Leiting Pan*, Jingjun Xu*. Characteristics of Intercellular Calcium Waves Communication in Micropatterned Assemblies of Single Cells. Pengchong Jiang, Fulin Xing, Bu Guo, Jianyu Yang, Zheming Li, Wei Wei, Fen Hu, Imshik Lee, Xinzheng Zhang, Leiting Pan*, Jingjun Xu. 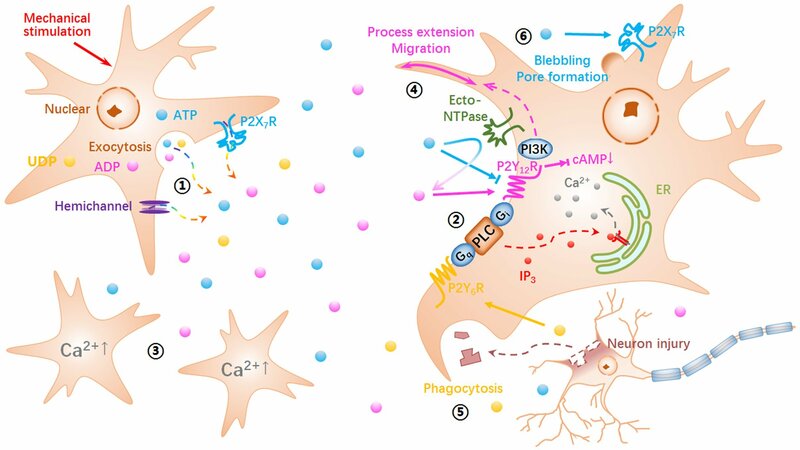 Nucleotide transmitters ATP and ADP mediate intercellular calcium wave communication via P2Y12/13 receptors among BV-2 microglia. Cunbo Li, Zheming Li, Shuang Xun, Pengchong Jiang, Rui Yan, Mincai Chen, Fen Hu, Romano A. Rupp, Xinzheng Zhang, Leiting Pan*, Jingjun Xu. Protection of the biconcave profile of human erythrocytes against osmotic damage by ultraviolet-A irradiation through membrane-cytoskeleton enhancement. Fen Hu, Zhenhai Hui, Wei Wei, Jianyu Yang, Ziyuan Chen, Bu Guo, Fulin Xing, Xinzheng Zhang, Leiting Pan*, Jingjun Xu. Hypotonic stress promotes ATP release, reactive oxygen species production and cell proliferation via TRPV4 activation in rheumatoid arthritis rat synovial fibroblasts. Wenshuai Jiang, Wei Xin, Shaonan Chen, Cunbo Li, Xiaoguang Gao,Leiting Pan, Zhibo Liu*, Jianguo Tian. Microshell Arrays Enhanced Sensitivity in Detection of Specific Antibody for Reduced Graphene Oxide Optical Sensor. Cunbo Li, Xuechen Shi, Mincai Chen, Xinglei Su, Pengchong Jiang,Leiting Pan*. Ultraviolet light A irradiation induces immunosuppression associated with the generation of reactive oxygen species in human neutrophils. Tengqian Sun, Qing Ye*, Fen Hu, Shike Liu, Xiaowan Wang, Jin Wang, Zhichao Deng, Jianchun Mei, Wenyuan Zhou, Chunping Zhang, Xinyu Wang, Leiting Pan, Jianguo Tian. Quantitative index imaging of coculture cells by scanning focused refractive index microscopy. Fen Hu, Fulin Xing, Ge Zhu, Cunbo Li, Junle Qu, Imshik Lee, Leiting Pan*. Rhein antagonizes P2X7 receptor in rat peritoneal macrophages. Fei Xing, Guixian Meng, Qian Zhang, Leiting Pan, Peng Wang, Zhibo Liu*, Wenshuai Jiang, Yongsheng Chen, Jianguo Tian*. Ultrasensitive Flow Sensing of a Single Cell Using Graphene-Based Optical Sensors. Qingquan Chen, Yiping Zuo, Wei Cai, Bin Zhang, Leiting Pan, Jianghong Yao, Qiang Wu*, Jingjun Xu. Giant field enhancement and resonant wavelength shift through a composite nanostructure. Fen Hu, Leiting Pan*, Kai Zhang, Fulin Xing, Xinyu Wang, Imshik Lee, Xinzheng Zhang, Jingjun Xu. Elevation of extracellular Ca2+ induces store-operated calcium entry via calcium-sensing receptors: a pathway contributes to the proliferation of osteoblasts. Shuyan Zhu, Yuxiang Wang, Leiting Pan*, Shuang Yang, Yonglin Sun, Xinyu Wang, Fen Hu. Involvement of transient receptor potential melastatin-8 (TRPM8) in menthol-induced calcium entry, ROS production and cell death in rheumatoid arthritis rat synovial fibroblasts. Guixian Meng, Leiting Pan*, Cunbo Li, Fen Hu, Xuechen Shi, Imshik Lee, Irena Drevenšek-Olenik, Xinzheng Zhang, Jingjun Xu. Temperature-induced Labelling of Fluo-3 AM Selectively Yields Brighter Nucleus in Adherent Cells. Leiting Pan, Kun Song, Fen Hu, Wenwu Sun, Imshik Lee. Nitric oxide induces apoptosis associated with TRPV1 channel-mediated Ca2+ entry via S-nitrosylation in osteoblasts. Xian Wu, Leiting Pan*, Ying Liu, Pengchong Jiang, Imshik Lee, Irena Drevensek-Olenik, Xinzheng Zhang, Jingjun Xu. Cell–cell communication induces random spikes of spontaneous calcium oscillations in multi-BV-2 microglial cells. Leiting Pan*, Xiaoxu Wang, Shuying Yang, Xian Wu, Imshik Lee, Xinzheng Zhang, Romano A. Rupp, Jingjun Xu. Ultraviolet irradiation-dependent fluorescence enhancement of hemoglobin catalyzed by reactive oxygen species. Directing Tissue morphogenesis via Self-Assembly of Vascular Mesenchymal Cells. Songzi Kou, Leiting Pan*, Danny van Noort, Guixian Meng, Xian Wu, Haiying Sun, Jingjun Xu, Imshik Lee. A multishear microfluidic device for quantitative analysis of calcium dynamics in osteoblasts. Leiting Pan*, Xian Wu, Dan Zhao, Nason Ma’ani Hessari, Imshik Lee, Xinzheng Zhang, Jingjun Xu. Sulfhydryl Modification Induces Calcium Entry through IP3-sensitive Store-operated Pathway in Activation-dependent Human Neutrophils. Xian Wu, Leiting Pan*, Zhenhua Wang, Xiaoli Liu, Dan Zhao, Xinzheng Zhang, Romano A. Rupp, Jingjun Xu. Ultraviolet irradiation induces autofluorescence enhancement via production of reactive oxygen species and photodecomposition in erythrocytes. Wenwu Sun, Leiting Pan, Zhuang Ma*. Hypo-osmotic stress enhances the uptake of polyethylenimine/oligonucleotides complexes in A549 cells via Ca2+ mobilization from intracellular stores. Magnetic Fields at Extremely Low-Frequency (50 Hz, 0.8 mT) Can Induce the Uptake of Intracellular Calcium Levels in Osteoblasts. Wei Li, Baiquan Tang, Xinzheng Zhang, Feng Gao, Longchang Liu, Qiang Wu, Leiting Pan, Cibo Lou, Shangyu Guo, Romano A. Rupp, Jingjun Xu*, Baiquan Tang. Investigation on the phase shift of extinction and phase gratings in Polymethyl methacrylate. Leiting Pan,Xinzheng Zhang, Kun Song, Wei Cai, Xian Wu, Romano Rupp, Jingjun Xu. Real-time imaging of autofluorescence NAD(P)H in single human neutrophils. Xinzheng Zhang, Junqiao Wang, Baiquan Tang, Xinhui Tan, Romano A. Rupp, Leiting Pan, Yongfa Kong, Qian Sun, and Jingjun. Optical trapping and manipulation of metallic micro/nanoparticles via photorefractive crystals. Leiting Pan, Xinzheng Zhang, Kun Song, Xian Wu, Jingjun Xu*. Exogenous nitric oxide-induced release of calcium from intracellular IP3 stores via S-nitrosylation in respiratory burst-dependent neutrophils.